This is basically a film that used Jackie as a drawcard, then made the most inoffensive and colourful film possible, without actually worrying if it is entertaining or not. – Various cameos bring the Wow. Only the action is only OK, the larfs virtually non-existent, the hotness sadly disappoints and the cameos (bar one) are largely pointless. 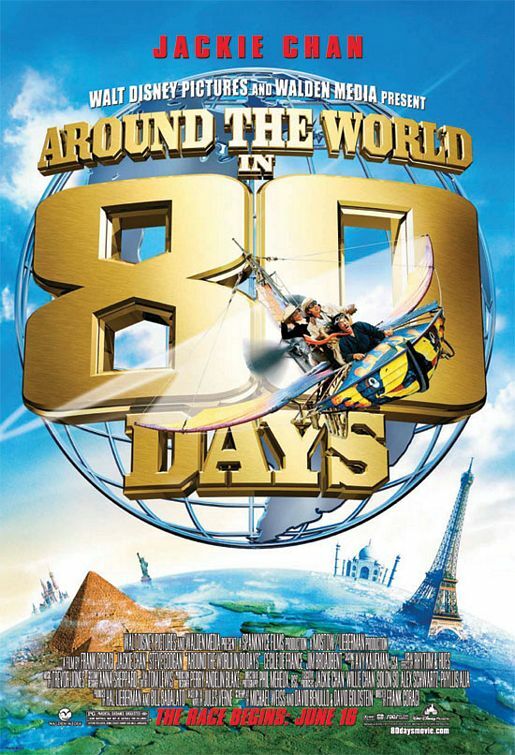 Jackie plays a Chinese-French valet to Coogan’s eccentric inventor Phileas Fogg, who accepts a wager that will see him endeavour to cross the globe in 80 days, (this is 1800s Britain after all). The film sees them (and De France who tags along) go through Europe, Asia (mainly China) and the US, and the film lends itself to chance meetings with various characters, and while they managed to get some names in they never do anything with them. Arnold Schwarzenegger Tries comedy with usual results. Terrible. Sammo Hung Only there for 1 fight, OK. Retro. Rob Schneider Tries comedy with usual results. As much as I hate him he was OK.
Luke & Owen Wilson The only good point, amusing as the Wright Brothers. Kathy Bates Necessary for the plot. OK. There is also a clumsy British cop sent to delay their progress whose misfortune is allegedly comical. I think I remember laughing twice in the whole two hours. This reeks of being a lazy cash in on Chan’s brand by using a familiar story and shoe-horning in a who’s who of known faces. The only funny thing about it is that it tanked big time in cinemas, and ended up losing a bunch of dough. 1/ Are there any “WOW!” fights? The second hour has a couple of nice fights, the 10 Tigers fight and the Statue of Liberty’s head fight (makes sense once you’ve seen it) are both OK.
2/ Are there any “WOW!” stunts? 4/ Does he get to use Jackie-exclusive toys? 5/ Do stolen relics come up? 6/ Are there hot chicks (that usually can’t act)? No, I don’t count the cuteness (at best) of Cecile De France as hotness. 7/ Is there a blooper reel over the credits? 8/ Were there injuries on the shoot? Severity? 9/ Has he still got it? The 10 tiger’s fight was a worthy flashback… but alas no. 10/ Is it a “Jackie Chan” film, or just one he is in? More a Steve Coogan vehicle cashing in on the JC brand. Final Rating – 6 / 10. In some ways I am glad this failed so spectacularly, this is lazy, unfocussed filmmaking. This entry was posted in Film, Jackie Chan, Movie Reviews, Superstars, The Grey Area. Bookmark the permalink.